Dyspepsia is defined as the presence of chronic/recurrent symptoms centered in the upper abdomen and may include discomfort or pain, bloating or distension, belching nausea or vomiting and early satiety. Gastro-esophageal reflux disease (GORD) is a clinical manifestation of excessive reflux of acid gastric contents into the esophagus causing various degrees of symptomatic irritation of the esophageal mucosa. Often GORD runs a chronic and relapsing course. Typical symptoms of GORD include heartburn, regurgitation and dysphagia. Atypical manifestations include laryngopharyngeal symptoms (chronic sore throat, pharyngitis, laryngitis, globus sensation); pulmonary (chronic cough or asthma); or cardiac (noncardiac chest pain) symptoms. Complicated GORD includes erosive esophagitis, hemorrhage, ulcerative esophagitis, Barrett's esophagus, and esophageal adenocarcinoma. GORD is a very common chronic disorder prevalent in many countries. It has been suggested that there is an increasing trend in the prevalence of GORD over the last two decades. Based on hospitalization and death rates, the prevalence of GORD has increased while that of peptic ulcer has been on the decrease. Population-based study in the USA revealed that 44% of the population reported monthly heartburn and 19.8% suffered from heartburn or regurgitation at least once a week. In all, GORD affects an estimated 25–35% of the US population. It is associated with a huge economic burden in western countries and significantly decreased quality of life. A limited number of hospital based studies have reported on GORD and its complications in the African countries, but there are no population-based studies describing its prevalence. GORD though a common digestive disorder worldwide is scarcely reported in Nigeria. Clinical trials conducted in patient populations with un-investigated dyspepsia are likely, therefore, to be heterogeneous and may comprise some patients with GORD and peptic ulcers and others with functional dyspepsia (FD). Clinical judgment alone is unsatisfactory and unreliable as overlaps exist between the different disease conditions causing dyspepsia. There is no gold standard investigation for diagnosis of GORD; however, upper GI endoscopy allows direct visualization of the esophageal mucosa. The sensitivity of endoscopy for GORD is 60% as compared to 24-h pH monitoring, but it has excellent specificity at 90%–95%. Endoscopy allows for grading of the severity of the disease. Twenty-four-hour ambulatory pH monitoring using pH probe has been found to be useful in establishing or excluding the presence of GORD. Good reproducibility and sensitivity (84%–93%) and specificity (90%) have been reported in endoscopy positive GORD. Twenty-four-hour pH monitoring, esophageal manometry and impedance studies are not readily available in Nigeria. Uninvestigated dyspepsia needs to be clearly differentiated from FD and dyspepsia of organic cause. The rising prevalence of GORD in western population and the growing population of patients presenting with dyspepsia to our health facilities is a challenge that calls for us to establish the burden of GORD in our environment. This is even so in the northern part of Nigeria where GORD has been scarcely reported, hence, we aimed to determine the prevalence of GORD among dyspeptic patients referred for upper GI endoscopy. The study was carried out at Aminu Kano Teaching Hospital (AKTH) Kano Nigeria. Approval for the conduct of the study was obtained from the Ethics and Research committee of AKTH (NHREC/21/08/2008a/AKTH/EC/096). Patients above the age of 18 years with dyspepsia referred to the Endoscopy Unit of AKTH for upper GI endoscopy were recruited, but those with previous endoscopic diagnosis were excluded from the study. Each consenting patient was administered a structured questionnaire on relevant demographic, clinical, social, and drug history associated with dyspepsia. Height and weight were measured and body mass index calculated (weight/height2 = kg/m2). Medications (antacids, histamine-2-antagonists, proton pump inhibitors, prokinetic agents, and herbals) that had been used during the preceding month before endoscopy were recorded. Following 8 h of fast, each patient had upper GI endoscopy performed using a forward viewing fiber-optic Olympus GIFQ-40 and the endoscopic findings recorded. 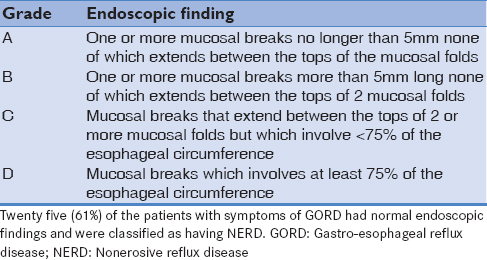 GORD was defined as symptoms of heartburn and/or regurgitation lasting longer than 6 months with or without a positive endoscopic finding. Those with endoscopy findings of esophageal erosion, Barrett's esophagus, esophageal peptic stricture, ulcer or adenocarcinoma on endoscopy were classified as endoscopy-positive GORD, while those with symptoms of heartburn or regurgitation but with normal esophageal mucosa were classified as endoscopy-negative GORD cases, i.e., nonerosive reflux disease (NERD). The Los Angeles classification of oesophagitis was used to grade reflux findings at endoscopy [Table 4]. Data were analyzed using computer-based Statistical Package for the Social Sciences for Windows version 16.0 (Chicago, IL, USA). Quantitative variables were summarized using range, mean and standard deviation while qualitative variables were summarized using ratios, proportions, and percentages. 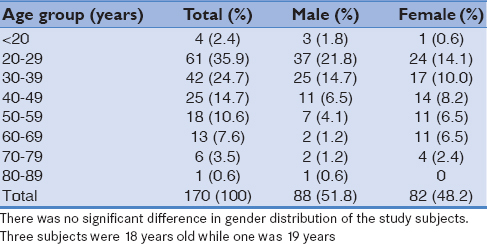 Of the 170 subjects studied 88 were males (51.8%) while 82 were females (48.2%), with M:F ratio of 1.1:1. The ages of the subjects ranged from 18 to 85 years with a mean of 37.6 ± 14.5 years the age 20–29 years had the highest frequency (35.9%) [Table 1]. The prevalence rate of GORD was 24.1%. Endoscopy positive GORD was observed in 16 (9.4%) while endoscopy negative (NERD) was observed in 25 (14.7%) of patients. The average duration of dyspeptic symptoms among all the study subjects as against GORD patients was thirty and twenty two months, respectively. 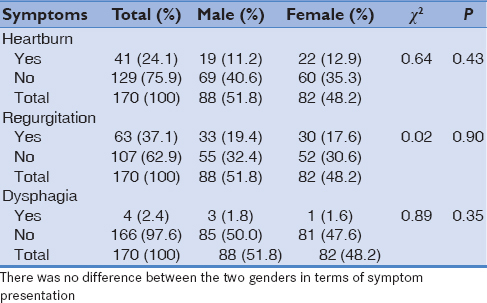 There was no difference between the two genders in terms of symptom presentation [Table 2]. Heartburn was found to have a high specificity (92.3%), negative predictive value (77.3%), low sensitivity (14.6%), and positive predictive value (37.5%) for endoscopy positive GORD [Table 3]. Regurgitation was found to have a high specificity (91.6%), negative predictive value (63.6%), low sensitivity (11.1%), and low-positive predictive value (43.8%) for endoscopy positive GORD. Majority of the patients were found to be on different medications (antacids, proton pump inhibitors, histamine-2-receptor antagonist) [Table 5]. Dyspepsia is a symptom complex rather than a specific disease entity. Several guidelines have been published regarding dyspepsia management, none of which have been specific for un-investigated dyspepsia. GORD is one of the diseases known to cause dyspepsia. The general agreement among researchers is that the prevalence varies in different parts of the world. Conventionally, GORD has been viewed as a disease of the western world and thought to be uncommon in the developing countries. In a Finnish study among patients with dyspepsia and reflux symptoms, 199 (18%) had heartburn. Barrett's esophagus, esophageal ulcer, or stricture, were detected in 248 (22%) patients. Of the 248 GORD patients, 81 (33%) had endoscopy negative GORD. It has been suggested that the prevalence of reflux disease is <5% in Asian countries but with increasing trends it has become more common than was previously thought. In a study among patients with dyspepsia referred for upper GI endoscopy in Egypt, 24% had endoscopically confirmed esophagitis. A hospital-based study in one of the tertiary hospitals in Nigeria, revealed a prevalence rate of 11% using a self-administered questionnaire and upper GI endoscopy as diagnostic tools. 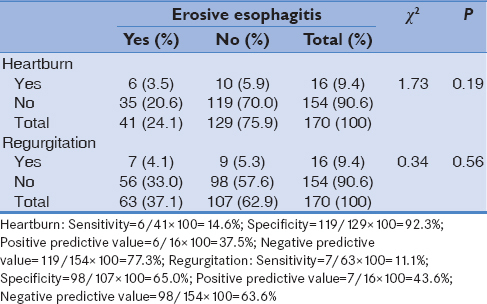 In another study in Nigeria, 25.6% presented with varying degrees of esophagitis in patients with GORD with Los Angeles grade A being the predominant endoscopic finding. The prevalence rate for GORD among dyspeptic patients referred for upper gastrointestinal endoscopy in our study area was 24.1% (with endoscopy positive as defined by presence of mucosal breaks, Barrett's esophagus, esophageal peptic stricture, or adenocarcinoma accounting for 9.4%. In patients with GORD symptoms, the reported prevalence of erosive esophagitis has varied from 3.4%–16.3% and there are indications that the prevalence of esophagitis may also be increasing compared to earlier reports. This shows that GORD is actually common and not rare especially in Blacks than was previously thought The accessibility of endoscopy facilities may influence these rates in our hospital referral area. The true prevalence of GORD may be higher still, as most reflux patients are treated by general practitioners without prior endoscopic assessment. In Nigeria, it may be that majority of those affected are managed outside the hospital setting as GORD is a chronic condition with spontaneous remissions and may respond to over the counter medications (all the patients studied were either on antacid, proton pump inhibitors, histamine-2 receptor antagonist or in combinations before endoscopy). These drugs are administered indiscriminately and easily procured over the counter which will undoubtedly affect the true prevalence rate. The incidence rate of both endoscopy positive and endoscopy negative GORD are probably biased by the use of proton pump inhibitors and histamine-2-receptor antagonists, i.e., only those with inadequate clinical response are referred for endoscopy. There are several potential explanations for the differences in reported prevalence rates in different countries. This may be attributed to cultural and language differences in symptom perception and interpretation. The term “heartburn” is not universally understood. The mean age of patients in the study was 37.6 years ± 14.5. The age range of 20–29 years had the highest percentage (35.9%). This is contrary to findings of other researchers on this subject who documented a rising incidence of GORD with age. It may be well that awareness and availability of endoscopic facilities might have influenced the pattern of referrals for endoscopy as GOR symptoms are chronic and troublesome. It is also a known fact that older patients are less likely to manifest symptoms of heartburn. The present study also revealed that heartburn has a high specificity (92.3%) and negative predictive value (77.3%) with low sensitivity (14.6%) and positive predictive value 37.5% for erosive esophagitis on endoscopy. Similarly, this was observed for regurgitation (specificity 91.6%, sensitivity 11.1%, positive predictive value 43.8%, and negative predictive value 63.6%). These findings are concordant with those of Klauser and colleagues who reported that heartburn and regurgitation have high specificity (89% and 95%, respectively) but low sensitivity (38% and 6%, respectively) for GORD observed on 24-h esophageal pH monitoring. Similarly, a European study (Sweden,) using a structured questionnaire that focused on the nature of symptoms, endoscopy (using esophageal mucosal breaks) and 24-h pH data as criteria for the diagnosis of GORD showed a specificity of 92% and a low sensitivity of 19%. These figures are superior to what was observed in this study because of the inclusion of 24-h pH as criteria in the diagnosis of GORD. Only 2 (4.9%) of the total number of GORD patients had endoscopic and histologic evidence of Barrett's. This is in keeping with a study in South Africa where only 5% of cases of Barrett's in blacks was documented despite the ratio of blacks to whites in the city being 5:1. Similarly, adenocarcinoma was observed in 2 (4.9%) of patients with GORD. Ahmed and colleagues assessed the frequency of erosive esophagitis and Barrett's esophagus among 105 Sudanese patients with symptoms of heartburn. Erosive esophagitis was documented in 45% and Barrett's esophagus in 10.6% of the patients. Similarly, a study among African Americans and white GORD patients in a prospective manner showed that symptom profiles were very similar between the 2 groups; however, African Americans were at a much lower risk of developing Barrett's esophagus. This supports the facts that Barrett's esophagus and esophageal adenocarcinoma continues to be rare in Sub-Saharan Africa. Again upper gastrointestinal endoscopy which was also used in this study has a sensitivity of 60% at least but has excellent specificity at 90%–95%. The combination of symptoms and endoscopic changes are highly specific (97%) for GORD confirmed with 24-h pH monitoring. Ambulatory 24-h pH monitoring and impedance studies are the most widely used tests to establish the presence of GORD and to correlate symptoms with investigative findings. These tests are invasive, inconvenient and not readily available in Nigeria. GORD may not be rare in Africans than previously thought. It may well be that majority of those affected are managed outside the Hospital setting as the condition may respond to over the counter medication which are relatively uncontrolled. There is a need for population-based studies involving larger sample sizes in the six geopolitical zones of Nigeria so as to establish the true prevalence of GORD. Studying racial and geographic differences in GORD and its complication are important as they highlight environmental or genetic influences in etiology and increase our understanding of the disease pathogenesis and management. Talley NJ, Silverstein MD, Agréus L, Nyrén O, Sonnenberg A, Holtmann G, et al. AGA technical review: Evaluation of dyspepsia. American gastroenterological association. Gastroenterology 1998;114:582-95. Heidelbaugh JJ, Nostrant TT, Kim C, Van Harrison R. Management of gastroesophageal reflux disease. Am Fam Physician 2003;68:1311-8. Shaker R. Protective mechanism against Supra – Oesophageal gastro-oesophageal reflux diseases. Clin Gastroenterol 2006;30:53-8. Vakil N, van Zanten SV, Kahrilas P, Dent J, Jones R, Global Consensus Group. et al. The Montreal definition and classification of Gastroesophageal reflux disease: A global evidence-based consensus. Am J Gastroenterol 2006;101:1900-20. El-Serag HB, Sonnenberg A. Clinical epidemiology and natural history of gastro-oesophageal reflux disease. Yale J Bio Med 1999;72:81-92. Princeton NJ. A Gallop Survey on heartburn across America. Princeton, NJ: The Gallup Organization, Inc.; 1988. Loker GR, Talley NJ, Fett SL Zinsmeister AR, Melton LJ. Prevalence and clinical spectrum of gastro-oesophageal reflux: A population based study in Olmsted country, Minnesota. Gastroenterology 1997;112:1448-56. Eisen GM, Sandler RS, Murray S, Gottfried M. The relationship between gastroesophageal reflux disease and its complications with Barrett's esophagus. Am J Gastroenterol 1997;92:27-31. Shaheen NJ, Hansen RA, Morgan DR, Gangarosa LM, Ringel Y, Thiny MT, et al. The burden of gastrointestinal and liver diseases, 2006. Am J Gastroenterol 2006;101:2128-38. Richter JE. Severe reflux esophagitis. Gastrointest Endosc Clin N Am 1994;4:677-98. Wiener GJ, Morgan TM, Copper JB, Wu WC, Castell DO, Sinclair JW, et al. Ambulatory 24-hour esophageal pH monitoring. Reproducibility and variability of pH parameters. Dig Dis Sci 1988;33:1127-33. Voutilainen M, Sipponen P, Mecklin JP, Juhola M, Färkkilä M. Gastroesophageal reflux disease: Prevalence, clinical, endoscopic and histopathological findings in 1,128 consecutive patients referred for endoscopy due to dyspeptic and reflux symptoms. Digestion 2000;61:6-13. Wong BC, Kinoshita Y. Systematic review on epidemiology of gastroesophageal reflux disease in Asia. Clin Gastroenterol Hepatol 2006;4:398-407. Gado A, Ebeid B, Abdelmohsen A, Axon A. Prevalence of reflux oesophagitis among patients undergoing endoscopy. Alexandria J Med 2015;51:89-94. Oginni AO, Agbakwuru EA, Ndububa DA. The prevalence of dental erosion in Nigerian patients with gastro-oesophageal reflux disease. BMC Oral Health 2005;5:1. Nwekediuko SC, Ijoma I, Obienu O, Agunyewa C. Gastro-oesophageal reflux disease. A clinical and endoscopic study of Nigerian patients. Internet J Gastroenterol 2008;8:5-10. Rosaida MS, Goh KL. Gastro-oesophageal reflux disease, reflux oesophagitis and non-erosive reflux disease in a multiracial Asian population: A prospective, endoscopy based study. Eur J Gastroenterol Hepatol 2004;16:495-501. Ho KY, Chan YH, Kang JY. Increasing trend of reflux esophagitis and decreasing trend of Helicobacter pylori infection in patients from a multiethnic Asian country. Am J Gastroenterol 2005;100:1923-8. Du J, Liu J, Zhang H, Yu CH, Li YM. Risk factors for gastroesophageal reflux disease, reflux esophagitis and non-erosive reflux disease among Chinese patients undergoing upper gastrointestinal endoscopic examination. World J Gastroenterol 2007;13:6009-15. Klauser AG, Schindlbeck NE, Müller-Lissner SA. Symptoms in gastro-oesophageal reflux disease. Lancet 1990;335:205-8. Carlsson R, Dent J, Bolling-Sternevald E, Johnsson F, Junghard O, Lauritsen K, et al. The usefulness of a structured questionnaire in the assessment of symptomatic gastroesophageal reflux disease. Scand J Gastroenterol 1998;33:1023-9. Mason RJ, Bremner CG. The columnar-lined epithelium (Barrett's oesophagus in the black patients). S Afr J Surg 1998;36:61-2. Ahmed HH, Mudawi HM, Fedail SS. Gastro-oesophageal reflux disease in Sudan: A clinical endoscopic and histopathological study. Trop Gastroenterol 2004;25:135-8. Abrams JA, Fields S, Lightdale CJ, Neugut AI. Racial and ethnic disparities in the prevalence of Barrett's esophagus among patients who undergo upper endoscopy. Clin Gastroenterol Hepatol 2008;6:30-4. Tefera L, Fein M, Ritter MP, Bremner CG, Crookes PF, Peters JH, et al. Can the combination of symptoms and endoscopy confirm the presence of gastroesophageal reflux disease? Am Surg 1997;63:933-6.